“In 1953, James Watson and Sir Francis Crick published their famous paper detailing the structure of the DNA molecule. Recognized as the single most important development in biology of the twentieth century, their discovery transformed the study of genetics and paved the way for huge advances in medical sciences as well as the fascinating science of DNA fingerprinting. They received the Nobel Prize for this discovery. 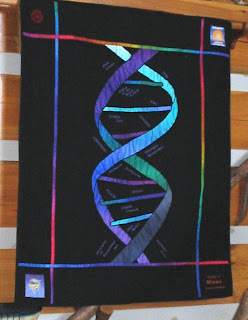 I made this DNA quilt for my longtime boss of 40 years, Dr. Whelan. Since he is a prominent scientist, I knew he would like this as a gift: he was a good friend of Sir Francis Crick and James D. Watson, and 2003 marked the 50th anniversary of the double helix. The label on the back of the quilt was kindly autographed by Sir Francis Crick (who passed away in 2004) and James Watson as an extra personalized treat. 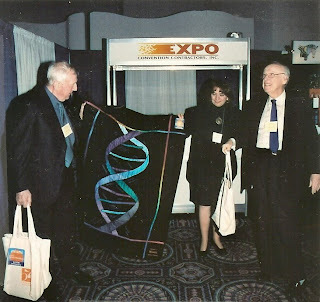 I presented the quilt to Dr. Whelan at a scientific conference in Miami in 2003, where Dr. Watson was an invited speaker (seen in the photo with Dr. Whelan and me presenting the quilt). Sir Francis Crick was supposed to be there but was very ill and could not travel. Dr. Whelan was thrilled with his quilt’s historical and sentimental significance. You can read Iris’s complete article in the March 2010 issue of American Quilter, on newsstand next week or by subscription at http://www.americanquilter.com/.